How To Choose Photo Paper for Printing? Photography is not just a hobby nor a profession – it is an art. Although, being different from many other hobbies, it requires sheer dedication, skill and talent to end up making something outstanding. Choosing the optimum paper may not be as easy as we think. I would say this part is most challenging to a neophyte. Having no experience in this field, it becomes difficult to select the right photo paper that should be used. Step into a shop and you will see many photo papers such as matte, gloss, silk, and more. Undoubtedly, a professional photographer brings life to every photo, but to have that same result one requires certain skills. I always consider the photography profession to be exquisite and talent oriented. Especially when you are a beginner, you are guided by many suggestions, but I am sure only a handful of them are useful. Let’s discuss some of the essential points you will need to keep in mind. Brands like Canon, HP, and Epson promise to offer a variety of inks and papers with the best quality. And, they do offer nothing less than the best. Their photo papers are high in quality, giving every paper a unique effect. This works well as some companies design papers that are customized for inkjet and yield great results. So, my advice for you is to use photo papers that are recommended by the manufacturer. This will enable you to get optimum printing, without getting a dull finish or a problem of color fading. On the other hand, for laser printers, you can use local made or plain laser papers. These printers can use the ordinary ones. 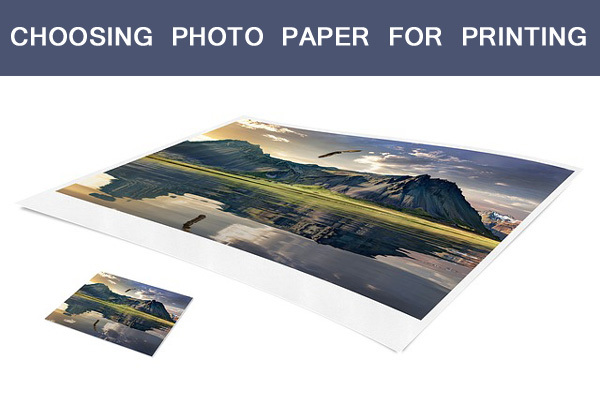 Whether you choose A3 photo papers or any other, the motive is to get quality printing. Weight of a paper is the weight of a square meter of paper, expressed as gsm (grams per square meter). Thickness of paper on the other hand is described in mils (thousandths of an inch). An effective way of making a printing successful is by using the right paper. If you send your collection to a lab, you will have a great variety of papers. However, to be an expert, you should know about different papers and their characteristics. This one gives darker blacks and with a good contrast. It also provides fine details of the image. Another good thing about matte is that it does not create distracting reflections. It is similar to a water-color paper, offering a matte finish along with a fair amount of texture. It provides a different overall look, with differentiating degree of color and contrast. It gives a new look to the image. Some images may appear beige or strong yellow and some more painterly in nature. Images that consist of a broad area of flat colors, similar to landscape, work very well on these. Fine art papers can feel good in a customer’s hands for special occasions. This gives a matte quality color and contrast. However, the color of the picture looks more vibrant than the matte paper. This is because of the unavailability of saturation and reduction in contrast, which is why the color gets enhanced. Even on A4 photo paper, the brightness of the image remains same. It requires more care because of its rough texture. You will find a huge number of photographers attracted to this type. The reason behind this is the ‘rich’ color of the paper that appears in the image. If your aim is to click snapshots, gloss and semi gloss is definitely a ‘yes’. However, the paper also creates shine and reflections that obscure your image. This type has a large impact on the image itself. The more you know the effects of this paper type, the farther you will go away from it because of its poor finishing. You must have noticed that photos fade after a few years. If you hang a photo in direct sunlight, within a short span of time its color becomes lighter. But, don’t worry, the good news is that pigment printers (inks produced through resins) offer images that are well off for over 100 years without any problem. And, even the dye printers deliver a good time period. However, this is not the only way to increase the longevity of images; it also depends on the ink/paper combination. In order to have maximum longevity, read the instructions carefully. Most people make the mistake of not reading directions carefully. Even vendors recommend a specific type of paper for better durability. The later an image shows color shifts, the better quality paper it has. Paper whitening is nothing but adding white agents to it. There is nothing wrong with using such agents, as the main idea of using it is to enhance the quality of the picture. The only problem, which occurs while using whitening agents is that the whiteness changes its color. In short, the paper will look extremely white initially, but after few weeks, its color changes to yellow. This creates a subtle change in the image. If you want an image to look the same over time, select a photo paper that does not include artificial brighteners. To recognize the difference between one with artificial brighteners and an ordinary one is that the former will be brighter on one side than the other, and the latter will be same on both sides. There is a chance that you may need printouts on an everyday basis. The good thing is you can use any paper type. If cost is not an issue, you can look for expensive paper; however, even an ordinary paper will be good enough to serve the purpose of basic printing. The cheapest paper you can look for is the one called ‘inkjet paper’. Brightness is the measurement of the amount of reflectance of blue light. Even though all papers seem to be bright, professionally, it is expressed in the range from 1 to 100. If you require high whiteness in the paper, use the one that is close to the 90s. Either the colors appear more vibrant or with light colors, they come out to be more washed out in a bright paper. Matte paper is used more for brightness than semi-gloss or gloss. To determine the brightness, use two photographs such as A4 photo paper made of matte and gloss. It is true that some colors will look beautiful on creamy white papers, while some on a matte paper, that’s why you need to be careful while selecting. In addition to this, the thickness and weight of the paper also should be according to the need. Thinner papers are more preferred instead of thick ones. If you are printing on your own printer, it would be economical to start with the manufacturer’s paper. In fact, many well-known companies who make photographic printers make their own papers and inks. These are specifically designed in order to match the characteristics of the printer delivering quality results. If you are open to experimenting with different papers, there are many papers that can be in your budget. There are endless choices for photo paper; spend some time to choose your favorite paper. Most people are confused where to begin when initiating photography printing. Whether we select A5 photo paper of any type or another we need experience in selecting the right one. To avoid mistakes, it is good to have proper guidance or look for professional assistance. You can read more about fine art printing for photographers here. My name is Andrew Wood. I am the owner of www.goinkjet.co.uk, a website about photo paper, printer accessories etc. I am also a very passionate blogger about technology and write about printing technology trends.